North Korea carries out what is likely its most provocative ballistic missile test to date. On early Tuesday morning, North Korea launched a ballistic missile that flew over Japan’s northern island of Hokkaido and landed in the northern Pacific Ocean. The missile flew to a range of 2,700 kilometers following its launch from a site near Sunan, near Pyongyang International Airport. The launch was North Korea’s first-ever overflight of Japan with a system identified as a ballistic missile. In 1998 and 2009, North Korea overflew Japan’s main islands with satellite launch vehicles — the Taepodong-1 and Unha-3 vehicles respectively. Its 2012 and 2016 satellite launches overflew Japan’s territory in the Ryukyu islands on a southbound trajectory as well. The missile was launched at 5:58 a.m. local time in Japan, flew over Hokkaido at exoatmospheric altitudes beginning at 6:06 a.m., and splashed down in the Pacific Ocean, some 1,180 kilometers off the Hokkaido coast, at 6:12 a.m. The ballistic missile reached an apogee of 550 kilometers. The apogee and range numbers would put the projectile launched by North Korea on Tuesday with a Hwasong-12 IRBM — albeit one fired to less than its maximum potential range. North Korea could have undertaken several measures to reduce the range of the missile, including by flying it on a depressed trajectory, including a heavier dummy payload, and even by shutting off its liquid-propellant engine earlier on in flight than necessary. Tuesday’s launch is perhaps the most provocative single ballistic missile launch North Korea has carried out in its three-plus-decades of missile testing. Overflying Japan with a missile that is designed to carry a “large-sized” nuclear payload to intermediate-ranges — most likely the Hwasong-12 intermediate-range ballistic missile (IRBM) — is unprecedented. Shortly after the launch on Tuesday, Japan’s chief cabinet secretary, Yoshihide Suga, noted as much: “This ballistic missile launch appeared to fly over our territory… It is an unprecedented, serious and grave threat to our nation.” Suga noted that Japan would coordinate an appropriate response with the United States and South Korea. The observed range on Tuesday would put the North Korean missile just short of the required range of strike Guam. North Korea had released a specific trajectory for a Hwasong-12 salvo launch earlier in August through it’s state-run media. Its leader, Kim Jong-un, reviewed the plan on August 15, but did not authorize a launch. Tuesday’s launch has the political effect of showing off that North Korea now has ballistic missiles that can strike ranges in the upper-range of what the United States would consider a medium-range ballistic missile (1,000 to 3,000 kilometers). 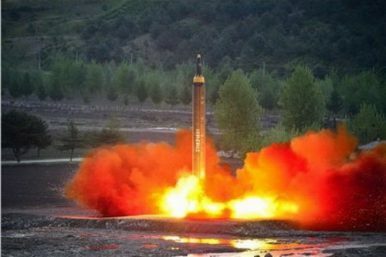 A full-range test of the Hwasong-12 could likely exhibit a much greater range; depending on the payload, the IRBM could reach ranges in excess of 4,000 kilometers. Though still early, some reports have suggested that the missile broke into three parts in flight. As I noted in an earlier analysis at The Diplomat, North Korea has compelling technical reasons to carry out a full-range flight test of its longer-range missiles, including the Hwasong-12 IRBM and even the Hwasong-14 intercontinental-range ballistic missile. Flying missiles on trajectories closer to their minimum energy trajectory would help simulate a more realistic stress and temperature endurance profile for the reentry vehicle. North Korea’s so-called ‘lofted’ tests to date in the Sea of Japan place the reentry vehicles under unrealistic stress profiles, given their descent from apogees that would never be seen in operational flight. If the missile did break up in flight and Pyongyang was able to observe it, that would still give North Korea important diagnostic information to eventually improve its airframe designs. Despite the technical rationales for testing, it’s unclear how North Korea would have collected telemetry data on the missile it launched on Tuesday in the descent and terminal stages of flight. Data collection at that distance would presumably require North Korea to place ship-borne sensors surreptitiously in the area — an unlikely prospect. North Korea would have a few other options to gather data (some of which I consider on a recent podcast on this launch), but the question remains open for now. The Sunan launch site, near Pyongyang International Airport, is a first for North Korea. The choice of this site suggests that North Korea continues to diversify its prospective operational launch sites and may have sought to catch the United States off-guard. However, hours before the launch on Tuesday, a U.S. government source with knowledge of the latest U.S. military intelligence on North Korea had told me that a KN17 (the U.S. intelligence community designation for the Hwasong-12) launch was assessed to be likely. The United States was not caught off-guard by this test, despite the introduction of a new launch site. North Korea’s choice to to launch a missile that is still in development with a 75 percent failure rate to date in such a heavily populated area shows a high tolerance for risk as well. An early failure in flight could have propelled the missile into population centers, causing great destruction. North Korea demonstrated similar risk acceptance with its most recent ICBM test, which took place near a heavily used missile assembly site at Mupyong-ni. How might the United States react? Well, we haven’t seen a flight of B-1B Lancer conventional bombers from Andersen Air Force Base at Guam since early August — certainly not since North Korea levied its threats earlier this month to strike Guam. The United States may feel compelled to fly bombers near North Korea to reassure Japan of its resolve. One of North Korea’s objectives with launches like this one is to drive a wedge between Tokyo and Washington. Accordingly, Washington may have to compensate by resorting to brash signaling — precisely the kind of behavior that North Korea has reportedly highlight as an impediment to direct diplomacy. Regarding political and diplomatic signaling, the Trump administration played its cards close to its chest after the launch. Trump reportedly spoke with Japanese Prime Minister Shinzo Abe on the phone and the Department of Defense released a statement assessing the launch, but the administration released no prominent public statement. Just days before Tuesday’s launch and a separate launch of three presumed Scuds on Saturday, U.S. Secretary of State Rex Tillerson had commended North Korea for showing a measure of restraint by withholding ballistic missile launches since its July 28 test of the Hwasong-14 ICBM. How the United States, South Korea, and Japan choose to respond will determine how North Korea assesses the costs of future launches that may overfly Japan. As noted above, Kim Jong-un has ample technical and strategic reasons to continue with these overflights, placing Japanese defense planners in a long-feared nightmare scenario and severely straining the U.S.-Japan alliance. Several analysts and commentators will argue for missile defense as a solution to this conundrum, but the U.S. Navy’s and Japanese Maritime Self-Defense Force’s Sea of Japan-based Aegis destroyers cannot obviously and consistently intercept IRBM-class targets. While Tuesday’s trajectory may have made interception possible, this would depend on a range of factors, including just how favorable the geometry of the trajectory would be to the placement of Aegis destroyers armed with SM-3 Block I missiles capable of exoatmospheric interception. In all likelihood, the response will consist of a renewed push for sanctions, punishment, and isolation of North Korea at international forums, including the UN Security Council. This is likely to prove insufficient in deterring future tests by Kim Jong-un. If anything, what Kim Jong-un’s new long-range missiles provide is the capability to experiment with new types of coercive bargain with the United States and its allies. The technical advances made in the process and the new capabilities proven are an important, if ancillary, benefit.